The solution Metro has floated multiple times before involve the construction of a new tunnel between Rosslyn and Georgetown, with the tracks continuing under M St. heading eastward through downtown. Most plans called for the Blue line to take this new route (otherwise known as the “separated Blue line”). But some proposals involve the Orange or Silver lines taking it instead. The proposal presented to the Metro board yesterday has many features besides the new tunnel. It calls for a new tunnel up the center of downtown to separate the Green and the Yellow lines. It recommends a new bypass at Rosslyn to allow eastbound trains along the Orange/Silver line to turn right and head down the Blue line tracks. It also recommends extending lines out to Centreville, Potomac Mills, and Bowie. So it’s obviously an ambitious plan. And the board praised the staffer for the plan. But they also focused on the obvious glaring omission in the plan: any funding ideas. To be fair, though, having a concrete plan makes it much easier to convince the jurisdictions to establish some sort of funding mechanism. Of course, “much easier” in this case still means “really, really hard”. 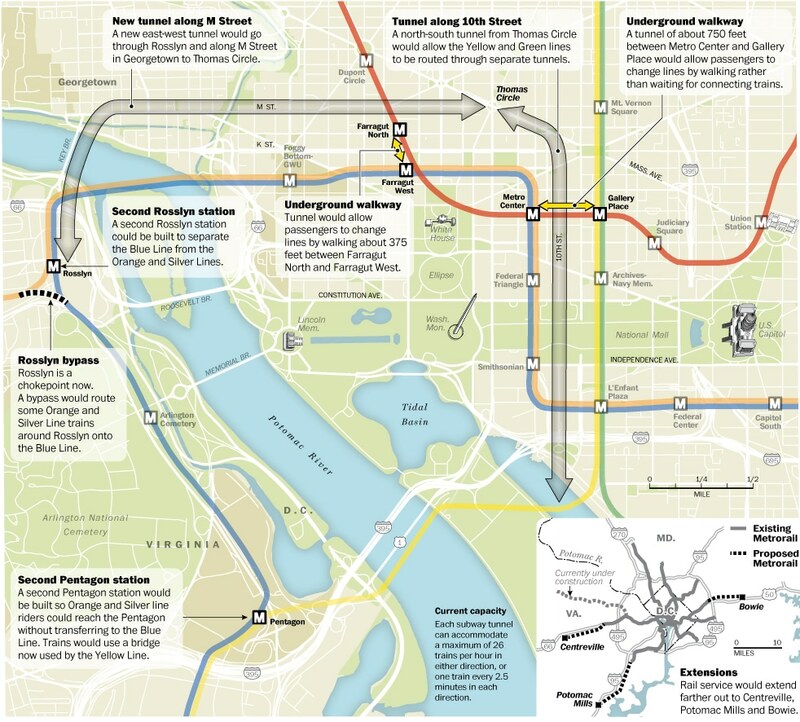 The real problem GM sees of these plans is that the new line through Georgetown appears to terminate at Thomas Circle. Earlier plans brought the new line to Union Station, and even beyond. Failing to connect Georgetown with Union Station would be a huge missed opportunity. Finally, as GM mentioned these plans have been floated before. In 2001 and 2008 WMATA proposed similar plans, only to see the plans quickly fade away after funding concerns were raised. Well, right on cue funding concerns have been raised. Will the plans fade away again or finally gain momentum? And where would one put the entrance(s) to a new Georgetown station? Any station in Georgetown will be very deep, given that one has to tunnel under the Potomac (and under Rock Creek as well), and there is little ability for a climbing grade before one actually is in Georgetown. And given the track curve radians, any station would probably have to be east of 33rd St.
No discussion is there about where each particular station would go, or the technical complications. Depending on where it went, a GU station would be extremely deep. But maybe the idea is to put a station along Canal. It’s not clear. A station by Georgetown University would likely mean a route that went down P or Q streets toward the West End. I could see a station at 28th and Penn, take the gas station, and close off 28th St. south of M Street. Another location could be at the park on the east side of Rock Creek, across from the embassy of Qatar. The canal location is probably not feasible given the deep parking garage at Georgetown Park. However, the parking lot opposite Cafe Milano might offer sufficient space. The matter of location is also compounded by geology. Tunneling a two track tunnel under M St. is one thing, tunneling a two track tunnel with a long platform(s) and the attendant stairs and escalators is another. And there is the matter of where to locate a vent shaft and emergency egress point..
Pingback: A $400 million windfall for D.C.